They're tough. They're stylish. They're unique. 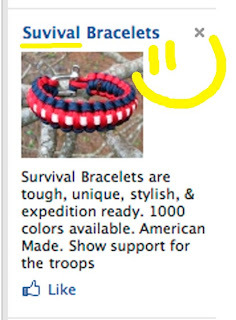 They are Suvival Bracelets!! Made in America. Show your support! We will suvive another Spelling Disaster!! It's a Bird! It's a Plane! It's Baloon Boy!! 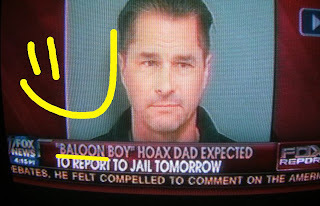 Baloon Boy. Baboon Boy. Yep, that's what they meant... Baboon Boy. I'm just sure of it. Hey, this appeared on Fox News. Need I say more??? Thanks to Dorene for catching this as it took flight! Hopefully she didn't shut down any major airports or call in the military while capturing this image. Unless, of course, she's trying to pitch her very own reality show. 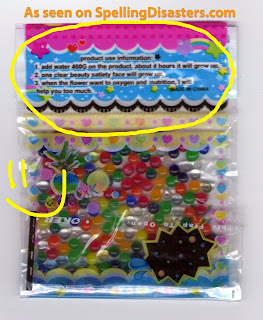 1. add water 400G on the product. about 4 hours it will grow up. 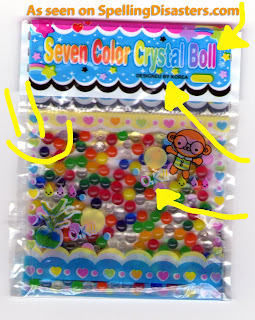 2. one clear beauty satiety face will grow up. 3. when the flower want to oxygen and nutrition, I will help you too much. O.K!! That makes all kinds of sense. Shouldn't Writers Be Able to Spell? The City of Coeur d'Alene's blog today featured this post promoting "Worshop" for the Writers Competition held annually with the Coeur d'Alene Library. Do you learn as much at a Worshop vs. a Workshop? Does that extra k give you a bit more knowledge? Spelling Disaster aside, what exactly is this headline telling us? "Worshop Add new Element to Writers Competition"
WTF does that mean??? Should it be"Workshop Adds New Element to Writers Competition" or "Workshops Add New Elements to Writers Competition" or "Workshop Adds New Elements to Writers Competition"??? What does it all mean???? I am at a loss for words. A loss. A huge, divine loss. 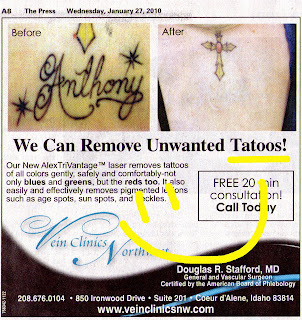 Not only can Vein Clinics Northwest get Anthony out of your life, they can misspell tattoo! I'd like to believe this Spelling Disaster was done on purpose to demonstrate their abilities with that AlexTriVantage™ laser. They lasered out that extra t and it didn't even hurt us. Amazing!! How old is your size 5 baby boy? Does the Sketchers Velcro keep him stuck to the carpet or wall? 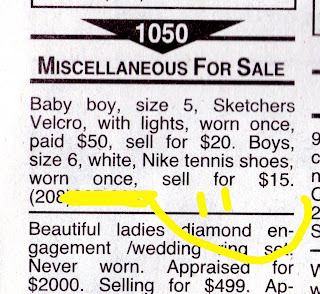 What lights up on the size 5 baby boy? His eyes? His ears? Did you wear the boys in one of those baby backpacks or sling? What insurance do you have where you only had to pay $50 to have this baby boy? If your size 6 boys are white, what ethnicity is your size 5 boy? What style are the Nike tennis shoes that come with the size 6 boys? Why are you selling your size 5 baby boy for $20 and your size 6 boys for $15? Valenine? Buy me a massage!! It's the perfect way to say be MINE! If we buy two, it's only Valeninety dollars! 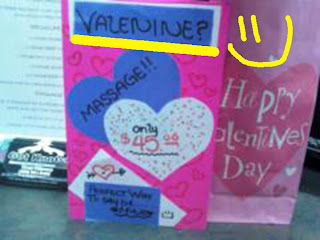 You can buy your Valenine a massage at the Coeur d'Alene Athletic Club who, according to their website, are located at 208 E Coeur Dalene Avenue in Coeur D Alene. 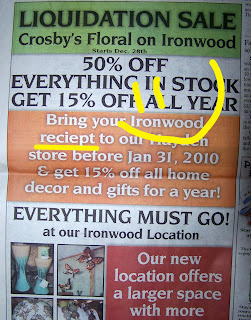 Thanks to Leslee for spotting this Spelling Disaster! I Want Me a Boquet!! 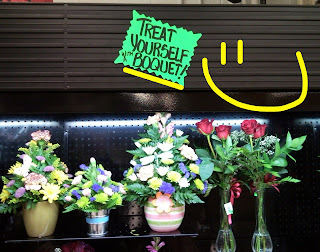 While shopping at Super 1 Foods in Coeur d'Alene last night, I was stopped in my tracks by this sign directing me to treat myself with a boquet! They are sort of pretty, those boquets. And the boquets aren't very expensive. Now if they had bouquets for sale, I imagine those would be even more beautiful and much pricier. Probably out of my budget. Yes, it's good our Super 1 Foods sells boquets not bouquets. Of those, a good portion were people or town names. But the top result sent shudders down my spine. The Flower Expert doesn't know how to spell the description of a bunch of flowers!! What kind of experts are they??? 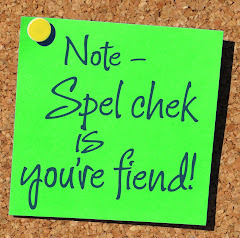 **edit - thanks to Bryan for catching my Spelling Disaster! Thank goodness I have the edit button!!! Following a robbery at Washington Trust Bank, Coeur d'Alene police got down to some math and statistics and even a bit of computer programing according to The Coeur d'Alene Press. Officers set up a parameter on downtown streets. You'd think if they were trying to catch a bank robber they'd set up a perimeter. But what do I know. I just work here and I don't carry a big, automatic weapon. The Brain May Do What??? 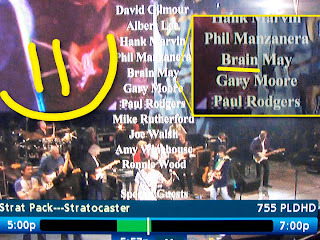 We enjoyed watching the Fender Stratocaster concert special on Palladia the other night. It was entertaining trying to identify the aging, famous guitarists. The one we recognized right off the bat was Brian May from Queen. A few jokes were cracked about his never changing hair while we listened to the final concert song. 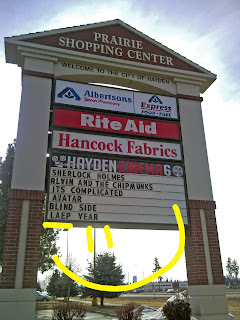 As the credits rolled, my dear husband hollered "Here's one for your blog!!!" as he dove for the remote to pause the telecast. Ah yes... Brain May. The ever so famous Brain May from the band Queen (I transposed the e and e if you hadn't noticed). Aloud - Allowed. Potato - Potatoe. My goodness is the English language just HARD to figure out, isn't it? We have entirely too many words that sound the same but are spelled different and mean entirely too many different things. 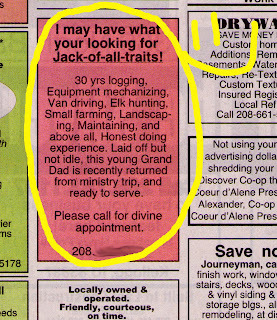 Take this example found on North Idaho ATV's website found by Megan's mom. 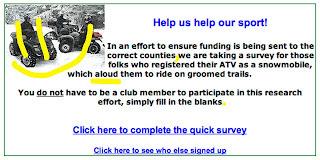 They're (there/their) looking for (four) folks who registered their (they're/there) ATVs as snowmobiles which (witch) allowed (aloud) them to (too/two) ride on groomed trails. In honor of the firstt Republican to be elected to Senate in over 50 years in the state of Massachusetts... This one's for you!! Thanks to Time Warner Cable's On Demand for this Spelling Disaster. 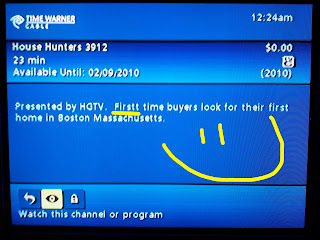 And please don't ask me what I was doing up at 12:24am watching House Hunters on On Demand. Don't ask. Really. Just. Don't. Stand back everyone!!! It's Comming Soon!!! Yes, it is!!!! 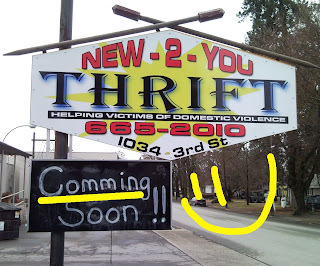 New-2-You Thrift is COMMING SOON!! Yes!! 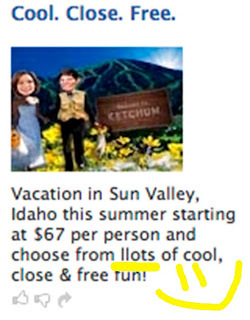 LLOTS of cooll, cllose and free fun!! Twenty five words. There are only 25 words! How do you include a Spelling Disaster in just TWENTY FIVE WORDS??? I'm going to blame it on the likes of Billl Gates, Tom Hanks, Bruce Willlis, Demi Moore, Oprah Winfrey, John Kerry, Cllint Eastwood, Mariell Hemingway and Arnolld Schwarzenegger... just some of the gazillions of famous people that own a home in that area. Come on punsters! You took the time to Photoshop the "Tiagra" bottle. You took the time to find a pic of Tiger Woods. You took the time to layout all the elements. You took the time to write the tiny fine print at the bottom. Why couldn't you take the time to spell aren't correctly??? How Often do Laep Years Come Around? I'm sort of looking forward to seeing the movie Leap Year - I usually enjoy Amy Adams movies. Not too sure about Laep Year. Has anyone seen the trailer for that? Who's starring in it? Adam Amys? Even though this appears in today's Coeur d'Alene Press, it is not their doing. In fact, I think I should thank photographer Shawn Gust for capturing the specialness of the Daily Speicals at Taco Time in Post Falls, Idaho. Thank you, Shawn!!! 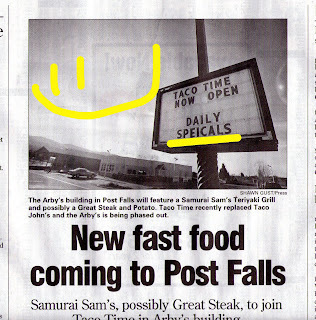 And thank you for not going in to Taco Time to let them know they had a Spelling Disaster featured prominently on their reader board which, in turn, would be featured prominently on the front page of the Business Section! What is it with the transposing of 'I' and 'E' that gets so many people? Did they skip the day in elementary school when we were taught "I before E except after C or when sounded like A as in neighbor or weigh." Maybe it's all the other exceptions that throw them off. Whatever it is, we can still expect a retail store would know how to spell receipt. Excuse me now... I need to go pick up the peices of my sanity that remain.